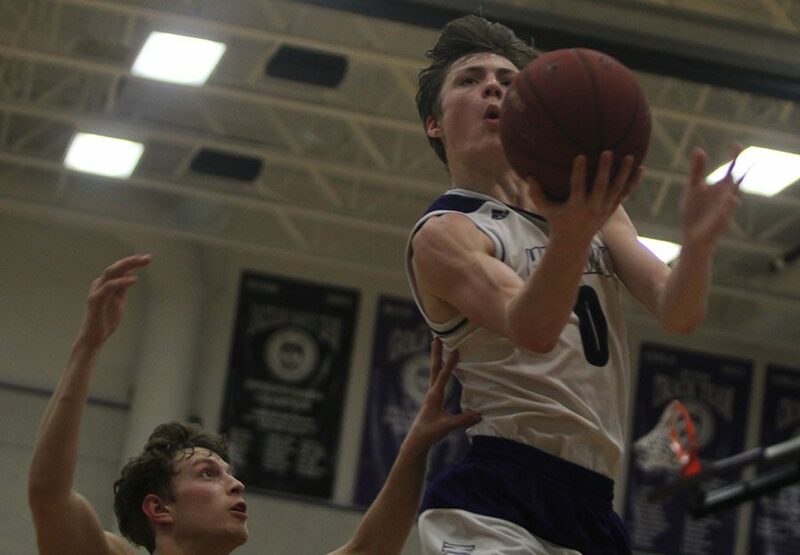 Senior Max Johnson and freshman Jack Chapman scored their career-highs as BVNW would go on to defeat Gardner Edgerton in the first round of sub-state. BVNW junior Christian Braun (0) goes for a layup against Gardner Edgerton Feb. 28. A first round sub-state matchup between the No. 1 Huskies and the No. 16 Trailblazers of Gardner Edgerton started off slow for Blue Valley Northwest. 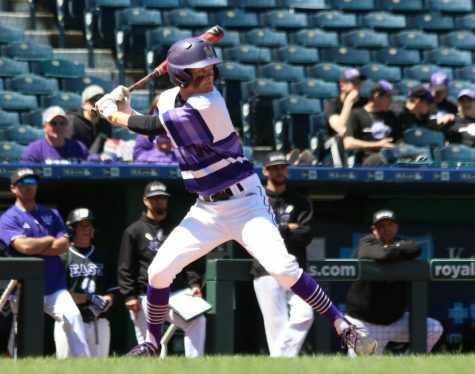 However, two Huskies, senior Max Johnson and freshman Jack Chapman, would provide a spark for BVNW on offense and would finish with career-highs in points on Wednesday’s game. BVNW played from behind for the first part of the first quarter. Gardner was able to move the ball around which often resulted in open shots near the basket. Head coach Ed Fritz said the Huskies need to start games off better than they did against the Trailblazers. “I thought we didn’t come out with energy and the focus we needed to to start the game,” Fritz said. After going down 4-0 in the opening minutes of the game, Johnson opened the scoring for BVNW with the first 3-pointer on his career-high night with 5:48 remaining in the first quarter. But, GEHS would continue to make plays offensively and found themselves with a 8-5 lead halfway through the first quarter. The No. 1 seeded Huskies would take control of the game after this point. The Huskies switched to a more aggressive zone which forced turnovers by the Trailblazers. After regaining the lead, Chapman hit a 3-pointer with just over two minutes left in the quarter to put BVNW up 18-13. After starting out slow in the beginning of the first quarter, the Huskies battled back to gain a 23-16 lead as both Chapman and Johnson had 5 points each after the first quarter. The second quarter would play out much different. After allowing 16 points in the eight minutes of play, BVNW would lock in on defense by forcing a lot of turnovers. On the offensive end, Chapman did it all in the second quarter. Chapman secured a couple of offensive rebounds which led to easy put-backs or sent him to the line after getting fouled. He also made two 3-pointers in the second quarter, including a buzzer-beater as time expired. At the half, Chapman had 15 points. Chapman would go on to score 5 points in the second half giving him a career-high 20 points for the game. Chapman said he was able to put up 20 points in part because of his teammates finding him for open shots. After a 10 point quarter from Chapman, the Huskies went into the locker room with a commanding 44-20 lead. The Huskies continued this momentum into the third quarter. BVNW was able to get a plethora of open shots which they converted on. However, Fritz said, his team was able to play much better defense after allowing 16 points in the first quarter. “We gave up four points in the second quarter, two points in the third quarter and kind of played the way we’re capable of playing,” Fritz said. Johnson was able to tack on two more 3-pointers in the third quarter to give the senior guard his career-high with 13 points. Johnson said while it was exciting to start out postseason play with a career-high, winning was more important. After dominating the second half, BVNW would go on to defeat Gardner Edgerton in the first round of sub-state, 77-34. With the win, the Huskies extend their winning streak to 13 games. BVNW will play host in the final round of sub-state on Saturday, March 3 at 6 p.m.